Support Panel Frameless Shower | Why do I need 1/2" glass? Why does my support panel need to be 1/2″ thick glass? A support panel is used anytime there is a door hinged from another piece of glass as opposed to being mounted directly to the wall. Unless there is head support, a support panel needs to be 1/2″ thick glass in order to hold the weight of the door. It also helps sustain against the twisting during door operation. Why is it so much more expensive when using a support panel? Sometimes customers will weigh the cost difference between a wall mounted door and having a door hinged from a support panel. We get asked all the time why it is significantly more expensive when adding a support panel, even if the size of the opening didn’t change. There are several variables that need to be taken into account which all summed together make up the difference. a) When you want to center the door in the opening you go from a two-piece (door/panel) setup to a 3-piece (panel/door/panel) setup. Factories charge for machine time, so the extra time to cut, polish, and temper the extra piece of glass has an effect on the cost. b) The third piece of glass added is now also a support panel. This panel needs to get bumped up to 1/2″ thick glass, which is slightly more expensive than 3/8″. c) More hardware is necessary to make this configuration happen. Also, the glass to glass hardware is larger, and more expensive than the basic wall mounted hardware. On top of that each piece of hardware has its own cutout in the glass, meaning more time on the automated CNC machinery. The image here labels the hardware necessary to have a door hinged from a support panel. As you can see you need the glass to glass hinges, support clamps to hold the support panel to the wall, and the floor clips. These are used to secure the door to the support panel so that it is able to operate. The operation of these hinges allows the the door to swing either in or out. These clamps are used to firmly hold the support panel to the wall. The smaller clips are not rated to hold the extra weight of the door, the support clamps are larger and equal height to the hinges. These clips are used to keep the glass from moving in/out, or tipping over. These are not rated to take the weight of any glass, they are just made to hold it either to a wall, floor, or knee-wall. Will I notice the difference between the other panels & door that are 3/8″ thick? Short answer is probably not. Normally the doors and panels have seals that are adhere to the edges of the glass to stop the water from splashing out. Where any these panels meet up with the support panel there will likely be one of those seals. If you removed that seal, stepped inside the shower, and ran your hand back and forth between the two pieces of glass, you might pick up on the fact that the support panel is an 1/8″ thicker. 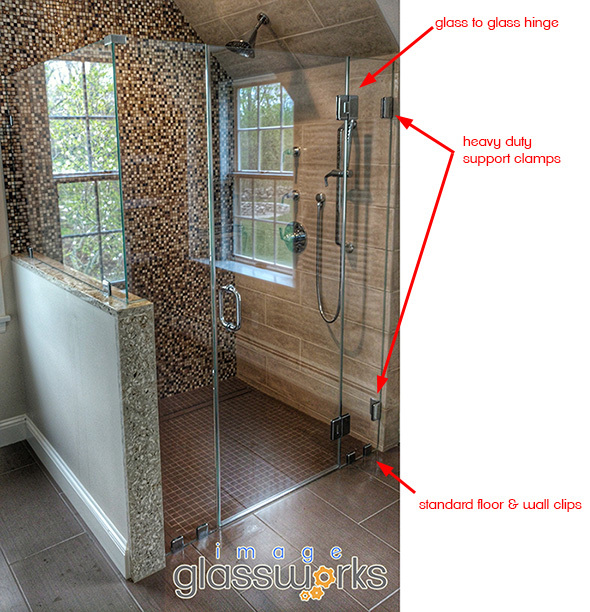 From a visual standpoint by just standing inside or outside the shower you will not notice the difference in the glass thickness. What are the restrictions or limitations when using a support panel? Aside from the requirements of the support panel being 1/2″ thick there are a few other limitations that CRL (the manufacturer of the hardware) specifies. The panel should not exceed 22″ in width. While we can customize the overall width of the panel for each enclosure, it is advised that the panel is not wider than 22″.